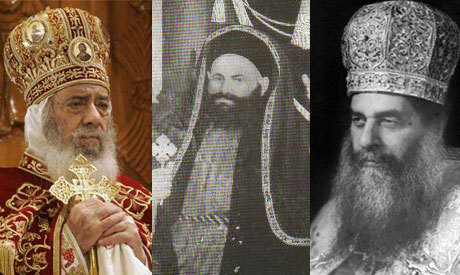 Ahram Online takes a quick look back at the last ten patriarchs of the Coptic Orthodox Church of Alexandria. Mark VIII, the 108th Pope of the Coptic Orthodox Church, inaugurated the cathedral in Azbakia in Cairo, which became the seat of the Coptic Pope until its transfer to Saint Mark's Coptic Orthodox Cathedral in Abbaseya in 1971. Even though he was only pope for four years, Mark VIII witnessed an event of great historical importance: the French invasion of Egypt in 1798. During the French invasion the church met a great challenge when a group of Christians supported the invasion and formed a battalion with the name "the Coptic battalion." During his papacy two churches were reportedly burned as the result of sectarian tensions. Peter VII, the 109th Pope of the Coptic Orthodox Church witnessed huge sectarian tensions. In one case in 1840, a Christian citizen was executed in Damietta, accused of insulting Islam. For the first time during modern Egyptian history, foreign states interfered and even offered protection for the Coptic Orthodox Church, yet Peter VII declined all offers. The Coptic Orthodox Church also witnessed in his reign huge rivalry with the Catholic Church, which led Peter VII to extend the activities of the Coptic church, for example by building libraries. After his death, the papal throne stood empty for over a year. The 110th Pope of the Coptic Orthodox Church is considered the "father of reform." During his papacy, the church played a diplomatic role, when Khedive Saeed sent Pope Cyril IV as an envoy to Ethiopian Emperor Tewodros II in 1856. The Emperor was amazed that a Christian bishop would work as an envoy for a Muslim price. He was credited with founding a printing house for the church and printing Coptic Christian books. Demetrius II was the 111th Pope of the Coptic Orthodox Church in Alexandria. Khedive Ismail during his reign helped the Coptic Orthodox Church by allocating money and land for its clerical schools. Demetrius II attended the inauguration of the Suez Canal, where he met the Ottoman Sultan Abdel Aziz. From 1870 to 1874 the papal chair was vacant. The 112th Pope of the Coptic Orthodox Church was the longest serving pope, reigning for over fifty years, and witnessing unprecedented political and social changes. Cyril V had ongoing disputes with powerful lay Coptic figures such as Prime Minister Boutros Ghali. In his reign, Cyril V witnessed Egypt change from Ottoman rule, to British rule, to the revival of the independence movement by Mustafa Pasha Kamel, then World War I and the 1919 revolution. During the revolution, Christian priests and bishops stood with Muslim sheikhs and addressed Muslims in mosques, while Muslim sheikhs addressed Christians in churches. The Coptic Orthodox Church also faced a new challenge during his reign, represented by the spread of the evangelical missionaries. The 113th Pope was the first bishop to head the Coptic Orthodox Church in the church's history. Before that, the church's tradition was to elect a monk for the papal position. From 1928 until the present day, there have been many disputes regarding this matter within the church. From 1942 to 1944 the papal chair was vacant. Although Macarius III, the 114th Pope, headed the church for less than two years, his reign nonetheless witnessed many tensions between the church, the lay congregational council, and the holy synod of the church over issues such as divorce. Amidst the huge conflicts in the church, Macarius left the papal headquarters in Cairo and stayed for a while in a monastery in Helwan, then moved around some monasteries in the east of the country. Prime Minister Ahmed Pasha Maher then had to interfere so that Macarius III would return to Cairo. During his reign, the church took important decisions like establishing clerical studies in Ethiopia and permitting divorce for adultery only. Macarius III was the second metropolitan bishop to be elected pope, after Pope John XIX. From 1945 to 1946 the papal chair was vacant. Pope Joseph II was 115th Pope of the Coptic Orthodox Church. He was the third Bishop without a diocese to head the church. Joseph II inaugurated the Institute of Coptic Studies in 1954. Despite the religious achievements of Joseph II, he was accused of being weak and faced financial corruption allegations. His reputation for corruption and weakness led a radical Christian group to kidnap Joseph II in 1954. He refused to abdicate and was rescued by police, but a little over a year later the holy synod and the lay congregational council decided to remove him from the papal office for the first time in the history of the Coptic Orthodox Church. He died shortly after in 1956. From 1956 to 1959 the papal chair was vacant and church affairs were managed by a committee of three bishops. Pope Cyril VI was the 117th Pope of the Coptic Orthodox Church. During the time of Cyril VI, the Coptic Orthodox Church of Alexandria began to play a diplomatic political role through its relations with the Ethiopian Orthodox Tewahido Church, which was under the spiritual leadership of the Church of Alexandria. In late 1968 Pope Cyril VI received the relics of Saint Mark the Evangelist and the founder of the Church of Alexandria. The relics were buried underneath St Mark's Cathedral, which was inaugurated in that year by Cyril VI at a ceremony that was attended by then-president Gamal Abdel Nasser. The cathedral has been the papal seat ever since. Born Nazeer Roufail in 1923, the future 118th Pope of the Coptic Orthodox of Alexandria graduated from the Faculty of Arts of Cairo University and worked as a teacher as well a reporter before choosing monastic life. As a bishop, Shenouda III and number of his students were suspended in 1966 by Cyril IV because of his campaign for changes and reforms in the church, such as calling for electing bishops and priests. The dispute between Cyril IV and Shenouda was later resolved. During his 40-year reign, Pope Shenouda III faced many social and political challenges, including the rise of the Islamists, sectarian tensions, the problems of building new churches, the dramatic increase in the rate of emigration, and questions over divorce. Shenouda III was also the first Pope in the last two centuries to stand against the ruler of Egypt, President Anwar El-Sadat, in 1981. He disagreed with Sadat on a number of issues, including the peace agreement with Israel and the president's policies towards Islamist groups. Because of this, the president sent him into exile at St Bishoy monastery in Wadi Al-Natroun in 1981, where he stayed for four years. He resumed his position and returned to Cairo in 1984. Shenouda III was popular among many Arabs because of his pro-Palestinian views, and he issued a decision to ban pilgrimages to East Jerusalem for Coptic Christians because of the Israeli occupation of the city. Shenouda III was the first pope to be enthroned at the St. Mark's Cathedral in Abbasiya and he will be the first to have his funeral held in the same cathedral. Photos compiled by Shery Gergawy and Karim Farouk.